Clyde say their "unduly harsh" punishment for fielding an ineligible player is inconsistent compared to similar offences after their appeal was rejected. A Scottish FA judicial panel on Monday upheld the SPFL's decision to dock Danny Lennon's team four points. Declan Fitzpatrick appeared in February's 1-0 win over Albion Rovers and 1-1 draw at Queen's Park. Both results were overturned, with the opposition awarded 3-0 wins. Berwick Rangers, who find themselves three points behind Albion at the foot of the table because of the ruling, are "fully supportive" of the Cumbernauld club's criticism of the decision. Clyde, currently four points behind Scottish League Two leaders Peterhead with three matches remaining, highlighted Hearts being docked two points for fielding an ineligible player in their League Cup win over Cove Rangers this season. A Clyde statement said: "That SPFL sanction resulted in Hearts accruing a point from a competitive game in which they fielded an ineligible player. At both the hearing and the appeal, the club cited the League One match between Ayr United and Peterhead in 2014, when Peterhead were found to have breached the rules by fielding an ineligible player. "The match was not declared void, but ordered to be replayed 'in the interests of sporting integrity and fairness to both sides.'" 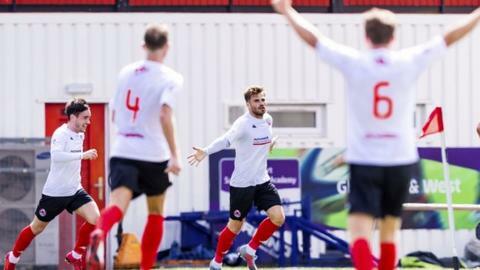 Clyde admit they made an "honest mistake" in fielding Fitzpatrick after he returned from a loan spell at Clydebank when the registration window had closed. Berwick have already tabled a rule change proposal to the Scottish Professional Football League to allow a club to recall a player from a loan at any time, not just in a transfer window, and for players to play at all club levels not just Reserves, if recalled. The Wee Rangers complain that they were told they could not be involved in the official appeal as they were not directly involved in either game, despite the decision having a knock-on effect. "There was no precedent in previous seasons, that Berwick Rangers were aware of, for awarding an opposition team a 3-0 win as well as inflicting penalties (this time on Clyde)," they stated.